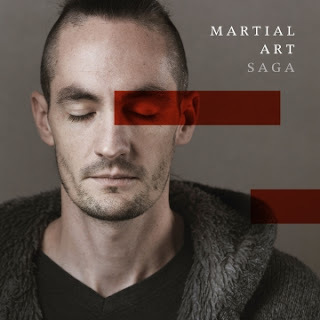 Take some ECM-styled atmospheric coolness, add some revved-up electric guitar, set it all to a potent beat, and you’ll get an idea of what Swiss trumpeter Martial In-Albon is up to with his Martial Art quintet on their debut release, Saga. In-Albon’s vulnerable sounding trumpet is the main solo voice. His sound is well-served by the supportive rhythm section of guitarist Philipp Saner, keyboardist Eliyah Reichen, bassist Bidu Rüegsegger, and drummer Nici Struchen. In-Albon has worked with pianist Nik Baertsch and a variety of big band projects in Switzerland. He’s influenced by a broad spectrum of musical disciplines, dominated by jazz/rock fusion, electronic music and Baertsch’s avant-groove sound. It’s no surprise that Saga is full of contrasts, beginning with the title track, which opens the disc. The music is gentle and ambient at first until a tempo asserts itself as the main melody kicks in. A wild electric guitar takes over, with bass and drums booming and crashing. In-Albon’s trumpet solo keeps the pace and intensity way up before slowing things down for a thoughtful solo. The music gradually increases in volume and tempo, with an abrupt halt as punctuation. Saga covers a lot of ground in just over eight minutes. Next up is the urgent Recovery which combines an insistent beat, distorted guitar, and funky organ licks. Ron in Rain, which follows, is hushed, the way the world sounds in a light rain. Even guitarist Saner is somewhat restrained on this one, though his solo has a gleaming electric edge. White Lies falls in between those two poles. It’s mellow at first, built on a simple ostinato that grows more heated after the first few minutes, driven by Struchen’s crisp drumming. A raging guitar solo and In-Albon’s strangled trumpet bring the piece to a rolling boil. The band seems to run out of steam for the finale, the rather somnolent The Cicada's Song. Instead of leaving you wanting more, the track almost makes you question the rest of the CD. Luckily, on rehearing the other five tunes, my enthusiasm remains intact, and I’m looking forward to the band’s next outing. 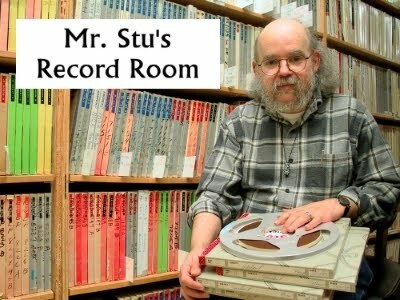 An earlier edition of Mr. Stu's Record Room with over 500 reviews is still at skremsky.tumblr.com.